Work the upper chest (clavicular pectoralis major), anterior shoulders and triceps using the decline push-up, a compound upper-body exercise. Use the Smith machine incline bench press to hit your upper pectoralis major with a heavy weight if you don't have a spotter for safety. The barbell JM press is a cross between the barbell skull crusher and the barbell bench press. It was invented by powerlifter JohnMark 'JM' Blakely. If you don't have access to a leg curl machine, try the inverse leg curl on lat pull-down machine, an isolated pull exercise that targets your hamstrings. The Smith machine standing overhead press is safer than the standard standing overhead press, which makes it useful for when you want to go heavy. The dumbbell w-press is an isolation shoulder exercise. Although quite rare, it is very effective at overloading the anterior and lateral deltoids. Unilateral exercises such as the one-arm hammer-grip dumbbell bench press are important for developing unilateral strength, balance and coordination. The inverse leg curl (aka bodyweight or Nordic hamstring curl) is useful for working your hamstrings in the absence of a leg-curling machine. 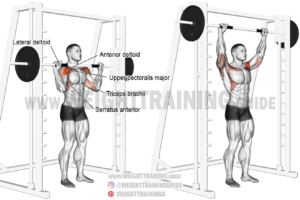 Emphasize the development of your anterior deltoid and upper pectoralis major using the seated elbows-in alternating dumbbell overhead press. Use the incline dumbbell fly to isolate and build your upper pectoralis major. Internally rotating your shoulders helps to better isolate the target muscles.